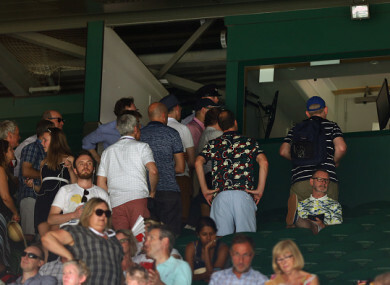 Fans watching England's World Cup quarter-final at the back of Centre Court last Saturday. WIMBLEDON CHIEFS INSISTED again that the men’s final will start at its traditional time despite it clashing with a potential England World Cup triumph. The All England Club has come under increasing pressure to rethink its 2pm start time for Sunday’s men’s singles final with the football showpiece in Moscow kicking off at 4pm. Should England defeat Croatia in Wednesday’s semi-final then the national team will feature in a World Cup final for the first time since lifting the trophy in 1966. “It is purely our decision to stay at 2pm. It will stay this year, it will stay next year,” said All England Club chief executive Richard Lewis. He added that there were no plans to show either Wednesday’s semi-final or Sunday’s final at the World Cup on Wimbledon’s giant TV screen attached to one of the sides of Court One. “Saturday was one of the most special days I can remember at the championships. The tennis was very good and there was a historic football match going on,” added Lewis. “People followed the football on their devices thanks to modern technology without disturbing other spectators. Lewis has become exasperated by stories that the All England Club has been indifferent to the national wave of affection which has engulfed Gareth Southgate’s football team. “We have a very strong public wi-fi signal and it worked brilliantly on Saturday,” he said. “That indicates that we are supportive of the World Cup and that we are not turning down the signal strength! Email “Wimbledon won't budge on traditional final start time despite World Cup clash”. Feedback on “Wimbledon won't budge on traditional final start time despite World Cup clash”.